Fosil Sangiran is the pseudonym for Seattle polymath Matt Shoemaker (1974-2017). The two recordings that have been uncovered from his archives under this moniker were recorded during a lengthy sabbatical in Java, Indonesia between 2012 and 2013. Though these works both operate very clearly within Shoemaker's aesthetic, he choose to operate under this moniker to provide a clarifying distance from what he believed to be his commonplace birth name. Sangiran refers to the UNESCO world heritage site in Indonesia where numerous archeological discoveries have been made providing insight into the understanding of early human development. It's an apt metaphor to his churning arrays of psychotropic sound design, which give the allusion of being distressed from aeons of jungle rot. Pasar Fosil is classic Shoemaker. At the core to this album is an ur-drone sculpted from electro-acoustics, analog synthesis, and most probably a radically altered field recording here or there. All of these accretions of sustained tone organize themselves with a rhizomatic logic of recombinant twists, folds, and mutations. Elegant harmonics with golden, clarion hues set the stage to this album, but Shoemaker would never allow for any his compositions to merely stand as polite ambient music. No. He deftly introduces sheared metallic timbres and rasping dissonance that tug with a gravitational heft. By the second half of the album, Shoemaker plunges into aural thickets that are openly hostile to the listener, articulated through allusions to a humid claustrophobia and radioactive toxicity. 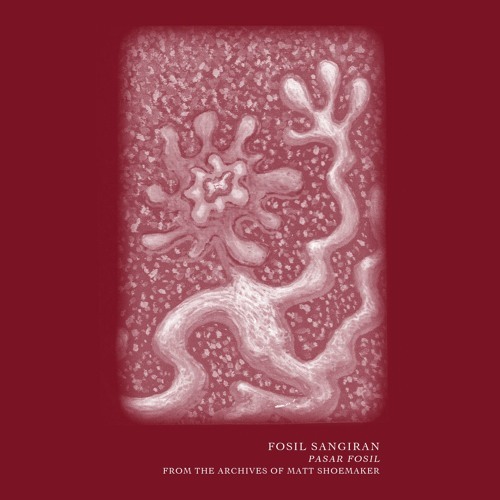 Even compared to the muscular minimalism of Organum, Pasar Fosil is unsettling as it is exquisite.